This CD is a real find. It is a great recording of what might best be described as post-modern chamber music by the California composer Peter Scott Lewis. Beaming Contrasts and Through The Mountain are the two highlights. They are both substantial new works that deserve to become staples of the contemporary chamber music repertoire. Yet the other three striking compositions are far from just filler. For anyone interested in contemporary chamber music, this well played and recorded CD is an essential acquisition. Delightful... Shimmering...Skillful. Unmistakably the work of an alert young American. Recommended. San Francisco composer Peter Scott Lewis writes music marked by an appealing combination of intricacy and rhetorical straightforwardness, and the five pieces included here -- in excellent performances by San Francisco based musicians -- afford a good entree to his work. The most immediately accessible work is the opening “Journey To Still Water Pond,” a quietly colorful nature portrait for vibraphone, marimba, and string quartet. But there are other pleasures here, too -- particularly the far-ranging title piece, which gets a suitably protean rendition by guitarist David Tanenbaum and the Alexander String Quartet. Peter Scott Lewis’ new CD on New Albion is something completely different. The piece that has held my attention (and garnered plenty of response from WPKN listeners) is “Journey To Still Water Pond.” Lewis develops a beautiful tension between strings and percussion that grips you tightly. Another exciting piece is “Little Trio,” a mix of aggressive exchanges and romantic phrases. Peter Scott Lewis’ new CD of chamber music is passionate, yet lyrical. This is music making by a virtuoso composer. 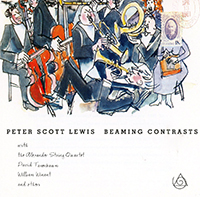 The boldest essay was Peter Scott Lewis’ Beaming Contrasts (1989), dialectic of steel and catgut exploring both differences and similarities between string and guitar textures. The amplified guitar strident, biting nature seemed to slice air when the duo played in jazzy syncopation with the quartet.